If you regularly frequent Reddit, or NeoGAF, or Kotaku's tips inbox, you've probably seen people talking about Half-Life 3 today. Don't get too excited—Valve's next shooter hasn't been announced yet. But there are a lot of rumors floating around. It started yesterday, when a user on the gaming message board NeoGAF discovered that Valve had trademarked Half-Life 3 in Europe over the weekend. Trademark registrations aren't exactly reliable indicators that news is coming, but crazed Half-Life 3 fans will happily gobble up any morsel of information that could be connected to some sort of Half-Life-related activity, so it became big news, even finding its way to the front page of Reddit (which, funnily enough, knocked NeoGAF down for a large chunk of yesterday afternoon). The trademark is certainly worth a "hmmmmm"—why now? If they're just protecting copyright, wouldn't the Half-Life trademark suffice? 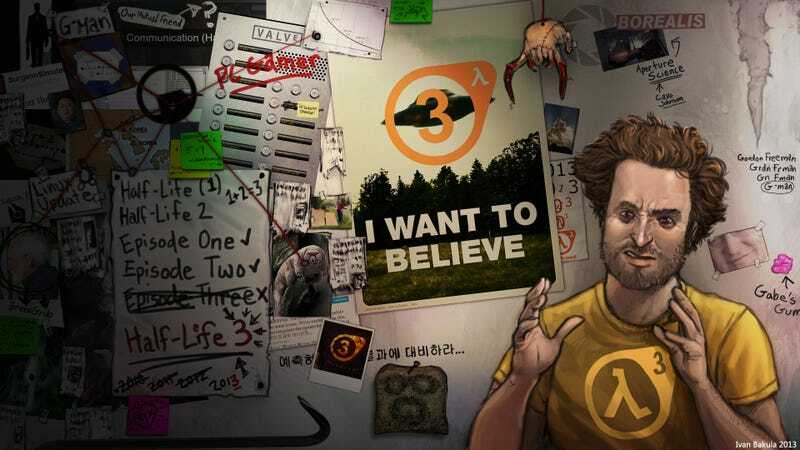 Is the U.S. government shutdown really just an ARG for Half-Life 3? Overnight, more news dribbled out, this time in the form of what appears to be a leaked page from Valve's JIRA database. JIRA is a project management software that companies use to track bugs and keep track of who's doing what—and in this case, the "what" appears to be Half-Life 3, among other things (like Left 4 Dead 3, which a tour group may have inadvertently leaked earlier this year). There have been JIRA leaks before, but between last week's big Steam announcements and the trademark registration yesterday, the chaos is gathering. Also, today is October 2. Tomorrow is October 3. Tomorrow will be the third day of the government shutdown. In the year 201... 3.